It’s one of the worst things to feel “under the weather” on a nice sunny, spring day. However, it’s important to listen to your body when the sniffles start to rise, which usually indicates that an adjustment is needed. Instead of dousing your system with over-the-counter medications that just mask symptoms and push them deeper inside, it’s important to take a look at what’s been happening in your life externally and internally (i.e. stress, non-healthy diet, over-worked, surrounded by others who are contagious, hygiene practices, etc.) that may indicate that restoration is needed. Here’s a simple cleansing recipe that will soothe, strengthen and warm your soul. Heat olive oil in a large stockpot on medium heat. Saute minced garlic and shallots for 3-5 minutes, stirring occasionally (do not burn). Add chopped chicken breasts. Stir and coat in oil. Add oregano, thyme, rosemary and black pepper. Stir occasionally. Cover and let simmer on medium-low heat for approximately 7-10 minutes or until the chicken is browned (but not all the way cooked). Add diced potatoes and carrots. Increase heat to medium and stir for approximately 5 minutes. Finally, add chopped celery. Simmer for approximately 3-5 minutes. Add 1 quart of vegetable broth (I used the low sodium Pacific Organic brand). I know this is not the authentic way to make chicken soup, but sometimes time is of the essence! Increase heat to medium-high/high to allow the soup to boil. Once the soup reaches boiling, reduce heat back down to simmer (medium/medium-low). Serve hot and let your system be cleansed and nourished! 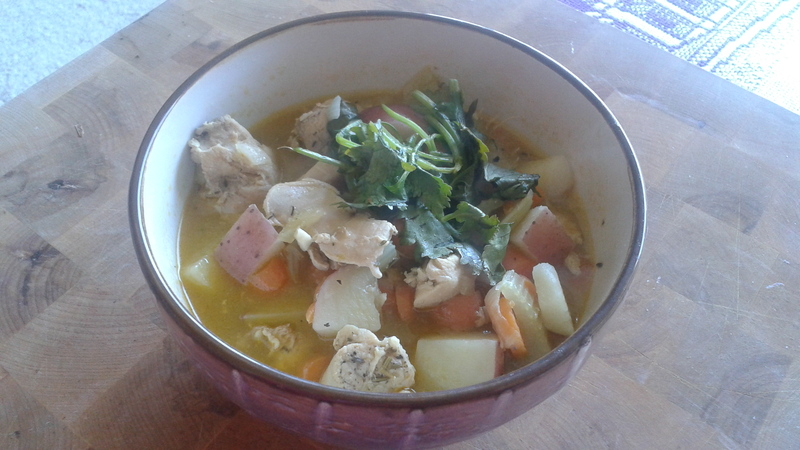 Click here for another immune strengthening soup recipe.